I’m really excited about Thanksgiving this year because for the first time I am in charge of all the food! I planned the menu, divvied up the grocery list between my Mom and myself, and will cook everything (except the turkey – I’m not a meat-cooking vegetarian, sorry – she will handle that part)! My Mom and step dad, Michael, have a lot going on and I am happy to step up and take care of things. But I’m not doing it just to be nice – I am really excited about cooking! And this will be the perfect introduction to Thanksgiving cooking for me since it will just be the four of us (them, myself, and Eric – well, Ella, too, but she will stick to her Tuna Delight and Chicken Tidbits). Plus, I can’t wait to use my Mom’s kitchen – oh glorious counter space, Kitchen Aid appliances, and pots and pans to spare! What a luxury it will be! 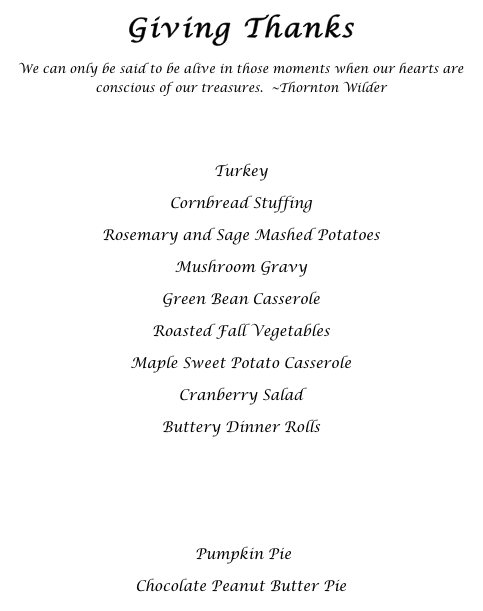 So, I thought in anticipation of the big day, I would share my menu with you! The Cornbread Stuffing (adapted to use vegetable broth) and Cranberry Salad are my Mom’s recipes, the Mushroom Gravy is from here, and the Pumpkin Pie is from here. The Rosemary and Sage Mashed Potatoes are adapted from Emily Malone’s recipe (minus the apple), and her Twice-Baked Sweet Potatoes will serve as inspiration for my Maple Sweet Potato Pie. The Green Bean Casserole and Roasted Vegetables are from Martha Stewart, and the Buttery Dinner Rolls and Chocolate Peanut Butter Pie are from the Pioneer Woman. I plan on adding some personal touches, like dark chocolate shavings on the Chocolate Peanut Butter Pie, to most of the dishes. I thought about making an apple pie – actually an Apple Pie Crumble I created (in my head – haven’t made one yet) that combines an adaptation of Martha Stewart’s pie filling, an as yet to be determined bottom crust, and the top crumble from the Pioneer Woman’s Dreamy Apple Pie. However, it sounded like Pumpkin Pie was going to be quite popular, and being the Pumpkin Pie freak that I am, I decided to just make two instead (and the Chocolate Peanut Butter Pie for Eric). Oh well, there’s always Christmas! I will be sure to take a lot of photos and let you guys know how it all turns out! I can’t wait! So, what are you doing for Thanksgiving? Any big plans? Keeping it simple? Do you have any fun Thanksgiving traditions?